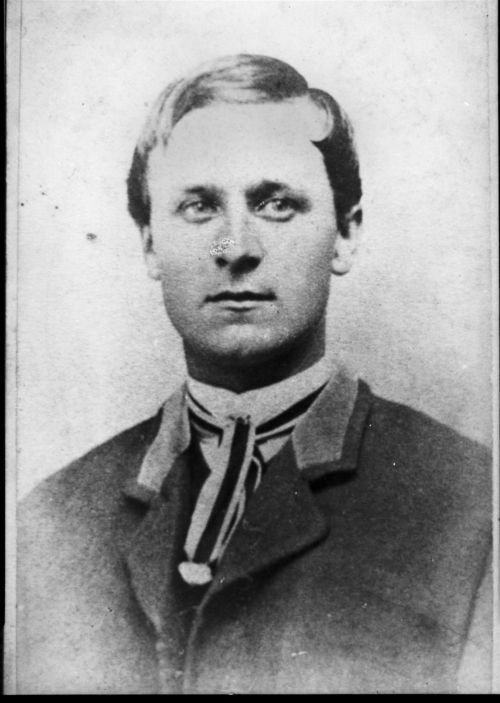 Dr. Brewster M. Higley VI, originally of Rutland, Ohio, was an otolaryngologist who moved from Indiana to Smith County in 1871 under the Homestead Act. at first Higley lived in a one-room dugout on his homestead 14 miles northwest of Smith Center, where he soon became a county officer. Soon he was living in a small cabin along West Beaver Creek. So taken with his new home, Higley wrote a poem entitled, "My Western Home," in celebration of the prairie. Soon newspapers around the state were distributing the lyrics. The Smith County Pioneer published the lyrics early in 1874 and reprinted them in 1914. The Kansas Farmer in Topeka printed a verse on April 22, 1874, and the Kirwin Chief published the poem March 21, 1874, then republished on the front page on February 26, 1876. Daniel E. Kelley, a friend of Higley's, was credited with picking out a melody on his guitar to serve as the tune. Kelley was a civil War veteran who moved to Gaylord in Smith County in 1872. He, his wife, Lulu Harlan Kelley, and two of her brothers formed the popular Harlan orchestra, much in demand between 1878 and 1885. "My Western Home" became a favorite dance tune. Kelley moved to Iowa in 1889. In 1925 the song was published as sheet music in San Antonio, Texas. David Guion, Dallas, Texas, revised the song in 1930 for a Broadway show, when it was retitled "Home on the Range." These published versions claimed no known composer or author. In 1934 William and Mary Goodwin filed a $500,000 lawsuit claimed infringement of their "My Arizona Home," which had been copyrighted in 1905. The Museum Publishers Protective Association (MPPA) conducted an extensive investigation on the claim. It discovered that all later versions could be traced back to John Lomax, a Texas university professor who collected folk songs and published a collection in 1910. Lomax had recorded a saloonkeeper singing "Home on the Range" in 1908. The saloonkeeper had previously driven cattle on the Chisholm Trail to Kansas. The MPPA found a mining song, "Colorado Home," with similar music and lyrics, that had been sung as early as 1885. Early Dodge City cowboys had also sung a version of "Home on the Range." The 86-year-old Clarence B. "Cal" Harlan, living in Smith County, recalled singing the tune 60 years earlier in the Harlan orchestra. The Goodwins' claim was rejected. Governor Arthur Capper in 1915 generated interest in designating a state song. The Woman's Kansas Day Club held a contest the following year. The Kansas Federation of Music Clubs held a similar contest in 1923. No winners were announced in either contest. In 1921 the song "My Golden Kansas" by Harry W. and Gene Stanley was considered, but the state legislature failed to adopt it. "Hymn to Kansas" by Luadah Sallee Baughman and Lewis C. Biggs was introduced in 1927. Members of the Kansas Authors Club opposed the song and the legislature failed to adopt it. Around 1930 the Kansas Federation of Authors honored Professor C. S. Skilton's tune written to accompany Esther Hill Clark's "The Call of Kansas." Legislators failed to adopt the tune as the state song. Native Sons and Daughters of Kansas sponsored another contest in 1937. Around 1945 the Kansas Commonwealth Club organized a campaign to promote the nationally popular "Home on the Range" for legislative consideration. Supporters claimed that the song was written in the state and portrayed an earlier time in the state's history. Detractors said that the song was erroneous since antelope no longer roamed the plains and antiquated in its portrayal of the state. After much discussion, the Kansas Legislature adopted "Home on the Range" as the official state song on June 30, 1947. In 1933 President Franklin D. Roosevelt claimed it to be his favorite song.Since then the song has been used in countless movies in shows, being sung by everyone from Willie Nelson to Porky Pig. And the sky is not clouded all day. Like a maid in a heavenly dream. Any poisonous herbage doth grow. That graze on the hillsides so green. If their glory exceeds this of ours. Forever in azure so bright.